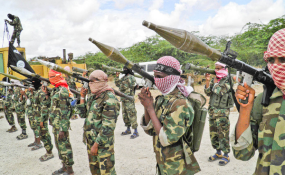 Al-Shabaab militia group (file photo). These trends in the spread of terror organisations in the region and Kenya in particular, will strengthen Kenya's resolve to maintain its troops in Somalia. In October 2018, President Uhuru Kenyatta re-emphasised that the army would remain in Somalia until stability and security is restored. His assurance was in response to the continued debate within the country about al-Shabaab's demand that Kenya withdraw from Somalia. Kenya's position will likely clash with the 2017 UN Security Council decision to downsize foreign troops in Somalia. All foreign troops under AMISOM are scheduled to withdraw from Somalia by the end of 2020. The DusitD2 attack was also a litmus test of Kenya's ability to deal with terrorism. The response by security forces suggested that counter-terrorism measures like the establishment of a joint operations centre, were working. These were adopted after the Westgate attack in which 67 people died. Along with more effective security force action, the country needs to invest in initiatives that tackle the drivers of radicalisation. Dealing with the trend of home-grown terrorism will require striking a good balance between security and development, as articulated in the United Nations Development Programme report , Journey to extremism in Africa. It will also mean working on long-term and holistic responses that uphold human rights and international law.